Everything you can tell us about this one ! The loco on the right, and the coaches far right, look like LYR to me. Otherwise I don’t have a clue. I have seen a blow up of this somewhere else but never seen the full picture. Is it GER? Cattle wagons looks to be. Loco has a stovepipe chimney. Coaches could be L&Y, or GER. A Great Eastern friend (who has just joined the LNWRS, so there is hope for him) has suggested looking north from Temple Mills, GER. Any of our usual ferrets able to confirm that? He adds that the two LNWR carriages on the left were at the front of the local goods coming off the Channelsea curve hauled by class Y14, 877, running tender-first and the MR 3-plank wagon was the next vehicle in the train, followed by other wagons. The cattle wagon, which originally made me think this might be in GER territory, is apparently not GER at all, but its ownership is not (yet) known. Can anyone help to identify it? And, for LNWR interest, can anyone explain why two odd but quite new LNWR 30ft 1in carriages were at the head of a GER goods train on GER territory? Perhaps I should clarify my statement that the LNWR carriages were quite new. They could have been ten years old, but were still front line branch line stock and not on their last legs and downgraded to workmen's use or the like. As one would expect for 1901, they still have the continuous lower footboards and Harrison alarm cord, as evidenced by the edge of the roof having blobs where each cord ring was positioned. Roger‘s details and identification of Loughton Branch Junction seem to fit the OS 25“ maps - see http://maps.nls.uk/view/101919765 for 1893 revision and http://maps.nls.uk/view/104194779 for the 1914 update. The junction seems to be at the top of the sheet, adjacent to Temple Mills Lane overbridge. The maps seem to indicate that the lines on the left are the High Meads Curve, I'm not sure exactly which lines were the Channelsea Curve, maybe the ones which converged with the Goods Lines further south near the turntable? On the face of it, this would seem to be at odds with the description given. The E&V (no.383) from Temple Mills would be an Up train, ie coming in the opposite direction to the other two. As far as I can ascertain, there was no BoT report on this accident. As no passenger train was involved, it would not strictly be necessary. However, I would expect that there would be a report in the minutes of the GER Traffic Committee, or of their Officers’ Conference. 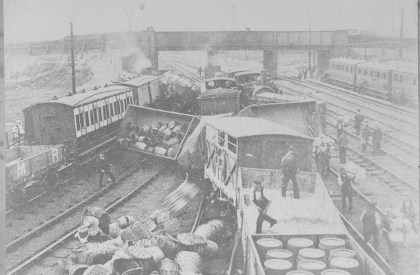 The two LNWR vehicles clearly were at he head of a goods train. I will have to think further about where they might have been going - it would be interesting to know the origin and destination of this train. It seems they were a van and a 5-comp (Third? ), which may have been intended for some special traffic? Perhaps a party from some GER station onto the LNWR, to be added as through coaches to a GER train? Just speculation. If they were damaged, the identities of the LNWR carriages may well be found in the Loco Committee Minutes. These days we forget that the “good old days” were not so good for everyone! According to the Locomotive Committee Minutes for 4.10.01, BV.479 was damaged at an accident at Loughton Jn GER on Aug 19. The damage must have been minor: 5 pounds to be charged to the GER. BV.479 was indeed 30'1, built Nov 1890.